That second book is now a movie airing on the Disney Channel, and Hughes, 44, no longer toils in obscurity. Touted as the next “High School Musical,’’ “Lemonade Mouth’’ — the story of five high school misfits who meet in detention, form a band, and challenge their cliquey classmates — premiered last Friday as the most-watched original cable movie of 2011. It airs again tonight. Though the novel itself did not become an immediate hit, Hughes did what he could to make sure it got noticed. In the summer of 2007 he and his wife, Karen, loaded their three children into their old minivan with the words “Lemonade Mouth’’ plastered across its sides and hood. The family left their home in Wayland and drove 13,000 miles through 38 states, stopping at 60 bookstores to sell and sign copies. Four years later, the book is getting more exposure than Hughes ever imagined possible. After the movie premiered, its soundtrack shot to No. 1 on iTunes. Disney aired the movie again Sunday and plans to run it regularly, no doubt with the success of “High School Musical’’ in mind. Disney, she said, was drawn to the novel because its characters appeal to both boys and girls and because of its message of empowerment. “Our focus is on telling relatable, relevant stories that connect to a generation of kids and their parents, too,’’ Grant said. “Lemonade Mouth’’ is an upstairs/downstairs story. The cool kids — the jocks, cheerleaders, and enablers — hang out upstairs in their Rhode Island high school, while the nerdy clubs and those in detention are consigned to the basement. It is all presided over by an inept principal who adores athletics but is indifferent to the arts. At the University of Rochester, he majored in electrical engineering and minored in creative writing, then earned a master’s degree in public health at the University of Massachusetts Amherst. For years, he worked as a consultant in managed health care, but he wrote young-adult fiction in his free time — early mornings, late nights, and whenever he called in sick to work. Stephanie Lane Elliott, the editor at Delacorte who bought “Lemonade Mouth,’’ said she was attracted to the five main characters, each of whom narrates the story line. Debra Martin Chase, who produced “The Princess Diaries,’’ “The Sisterhood of the Traveling Pants’’ and “The Cheetah Girls,’’ called Hughes after reading the book. One big change: Unlike the book’s hapless but headstrong protagonists, the stars have Hollywood looks and musical talent. There’s Bridgit Mendler of “Good Luck Charlie,’’ Adam Hicks of “Zeke and Luther,’’ Hayley Kiyoko of “Wizards of Waverly Place,’’ and others with equally impressive resumes. Hughes hopes the Hollywood treatment will give his book a bump in sales. Regardless, he said, his life will not change materially. 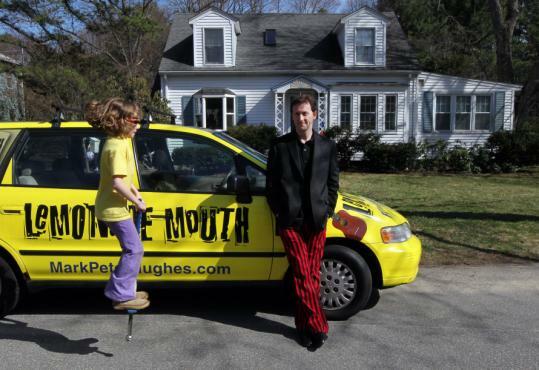 The family lives in a modest two-bedroom Cape and still drives the “Lemonade Mouth’’ minivan, which has 232,000 miles on it. Though they will not talk specifics, the couple makes it clear that their finances have not changed much. “Disney is going to make a billion, and I just want to pay off my house and buy a new car without taking out a loan,’’ his wife said with a laugh. There will be no McMansion, no private schools, no fancy wheels. Four years ago they made a deal with each other: She would return to teaching so her husband could write full time. This year she cut back to part time, and he has recently returned to the health care job part time, too. Hughes said his only splurge since Disney came calling was an aqua Epiphone Wildkat guitar (used, $400). His wife bought a new dress for the red carpet. That would be the red carpet at Wayland Middle School, where the premiere was streamed live, with raffles, bake sales, and a real red carpet, where attendees were invited to show off their finery. The event was a fund-raiser for the school, which, like the one in “Lemonade Mouth,’’ has suffered budget cutbacks. There was standing room only, and $3,000 was raised for the music and art programs. The attendees included the three Hughes children — 13-year-old Evan (who goes to school there), 11-year-old Lucy, and 9-year-old Zoe. Like the characters in “Lemonade Mouth,’’ everyone in the family plays an instrument. Hughes’s new novel, “A Crack in the Sky,’’ is about a domed city in a post-apocalyptic time, with a 13-year-old protagonist, a global warming message, and a telepathic mongoose. He is working on a sequel to “Lemonade Mouth,’’ and a new version of the original — one appropriate for younger, Disney-age viewers — is due out May 24. Through it all, Hughes is enjoying every minute of his newfound fame.